Have you explained what you've already tried to solve your problem? Have you specified which language and platform you're using, including version number where relevant? If your code doesn't compile, have you included the exact compiler error? If your question doesn't include code, are you sure it shouldn't? If your program throws an exception, have you included the exception, with both the message and the stack trace? If your program produces different results to what you expected, have you stated what you expected, why you expected it, and the actual results? If your question is related to anything locale-specific (languages, time zones) have you stated the relevant information about your system (e.g. your current time zone)? Have you checked that your question looks reasonable in terms of formatting? Have you read the whole question to yourself carefully, to make sure it makes sense and contains enough information for someone coming to it without any of the context that you already know? Don't forget that you're basically asking other people to help you out of the goodness of their heart - it's up to you to do all you can to make that as simple as possible. 1 If you went from "something's not working" to "asking a question" in less than 10 minutes, you probably haven't done enough research. This should include things like normal web searches (e.g. for an error message you're receiving), checking the documentation, debugging (particularly for exceptions) and searching on Stack Overflow itself for similar questions. 2 Ideally anyone answering the question should be able to copy your code, paste it into a text editor, compile it, run it, and observe the problem. Console applications are good for this - unless your question is directly about a user interface aspect, prefer to write a short console app. Remove anything not directly related to your question, but keep it complete enough to run. 3 Try to avoid code which makes users scroll horizontally. You may well need to change how you split lines from how you have it in your IDE. Take the time to make it as clear as possible for those trying to help you. 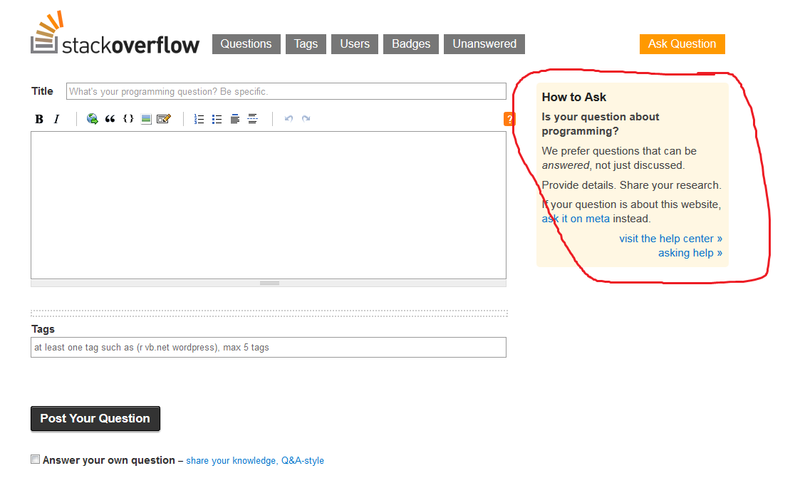 4 I realize that English isn't the first language for many Stack Overflow users. We're not looking for perfection - just some effort. If you know your English isn't good, see if a colleague or friend can help you with your question before you post it. I think to actually get the average asker of bad questions to read those items, they need to be fewer and shorter. This means sacrificing precision. Did you google your question (going beyond the first page)? What language/IDE are you using? Did you even supply code for your question? Does your sample code compile/run? Is your sample code formatted to be readable? Did you include the full error message, if you get any? Is your spellchecker turned on? Yes, this does not include a lot of useful/good information of the original list, but all that information is no use if it's not read, and I'd rather have them read the limited version than not read anything at all. Did you explain your EXACT problem? Did you search for similar questions? and then I would turn each of those points into a hyperlink which can be clicked to get a more detailed comment, what is recommended, why and who to process this point. That way you have something like a check list which I would display like the "How to ask" orange box visible whenever you ask a new question and which links to a FaQ/help section if you need further details on one or more points mentioned above. "If a picture is worth a thousand words, a video must be worth millions (of words)". A long and dense FAQ/checklist seems like a logical candidate for a video especially for newbies. Significantly, it took at least 30-40 minutes to find an OK Stack Overflow how-to video. It seems like Stack Overflow is a text-only site (for ex-Usenet users maybe?). Joel Spolsky claims in his talks that Stack Overflow is a break from Usenet email-style conversations. Maybe it's time to add some video help especially for newbies. It's an oft-repeated complaint newbies don't RTFM, FAQ, Checklists, etc. From the newbie perspective the primary urge is to 'Answer my question/solve my problem/do my homework already!!'. To get better quality questions and answers we need to help newbies re-focus on Stack Overflow readership rather than the question. The video would help the newbie get over the entry barrier (kind of like a human-operator option of an IVR system). Cognitive Style: The communication medium has to suit the newbies' learning style - Video, Audio, Kineaesthetic (jsFiddle). Reduce time for a newbie to get at least 60-80% of the process right the first time? Show him/her how to do it with an example video. Reduce effort by meeting them half-way by doing the reading/demonstration. Non-native users are not too comfortable with reading English. Adding subtitled small video-clips can go really far in reducing the entry barrier. A playlist of multiple 5-10 minute clips is more useful than a single big video. If a newbie learns the top 80% of proper usage from the videos, the site should see a lot of happy users - newbies as well as moderators. The rest can come from links to FAQ, experience, etc. Helps moderators give short clips to reduce/avoid specific misbehavior. Helps "goal-oriented"/"attention-deficit"/"reading-disabled"/clueless newbies latch on fast. Helps reduce learning curve and bridge the learning-gap with least effort. YouTube is full of newbie learning videos (from Arduino to graphene to cooking). Searching video-first and text-next saves time/effort and gives a starting point if it's worth following up. These are currently available videos which can act as starting points. They are too lengthy to be useful as they are. However, making 5-10 minute clips would make a huge difference in accessibility. The video-clips can be incrementally user contributed and remixed via Mozilla Popcorn. TED.com and Mozilla use Amara.org team/individual subtitle editor to crowd-source subtitles and internationalize their videos. I have here an invisible checklist that an asker can easily paste into their question and use as a checklist checking of items as they go. Just make sure to copy it all1 and check to make sure it doesn't show up in the actual question. 1the <!-- and --> are vital in order for the checklist to NOT show up. You DO NOT want the checklist to show up as it(most likely) has NO relevance to the question you may want to ask. Note: This checklist is based off of the above checklist. How do you best research your question before asking it on SO? Are Excel formulas on topic? Penalty for answering help-vampire questions? Or reward closure? Should we edit answers to remove mini-rants? Is my question on topic? Shall we close as unclear a question where OP simply failed to say that he could not compile? Why was this specific question about Rust generics put on hold?